This fall we have a treat for you as Nova Scotia’s Roxeen & Dalrymple (Roxeen Roberts and Gary Dalrymple) journey to Georgetown. 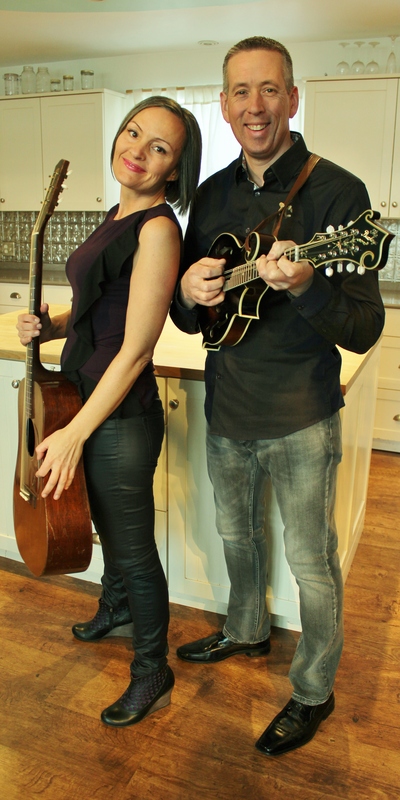 Teamed together originally twenty-five years ago, they reunited after a life of separate musical paths as a classic guitar and mandolin duet, a tour de force of vocals, rhythm and traditional melodies. They are highly respected veteran musicians, multiple East Coast Music Award and Maritime Gospel Music Award nominees, and winners of numerous Eastern Canadian Bluegrass Music Awards. For 25 years, Gary Dalrymple performed as part of The Spinney Brothers, a Nova Scotian bluegrass band with international recognition. He teamed up with his old friend Roxeen Roberts to bring their passion and deep rooted sincerity to the classic sounds of traditional country, bluegrass and gospel music. Come out for this special treat! $12.50 in advance, $15 at the door. For our concert dinner, we’re kicking it old school and offering a homey chicken à la king: a rich creamy stew with peppers, mushrooms, sherry, and fresh herbs served over Robinhood Meetinghouse cream cheese biscuits, and includes a side green salad. Concert and show $30.50 includes tax and tip. Maine beers on tap, wine and more snacks!